Finally the north winds moderated and left us with some light southerlies we could sail on. We were EXUMA BOUND! 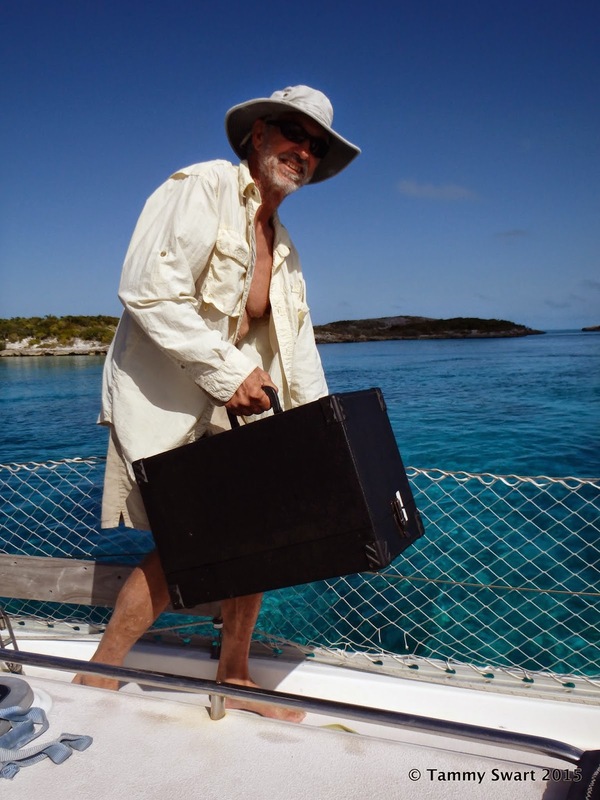 We left Marina Cay on New Providence Island at just after 8 am headed for Allen's Cay. Our course of 124° for nearly 30 miles took us a leisurely six hours. That's six hours of true sailing bliss! Discovery of a small rip in our jib did not dim our joy! It didn't look like it could get much bigger so we continued to sail on! We crossed the yellow bank, a cluster of coral heads in shallow waters, and then made our way into less stressful/more deep waters. Still new at this, we practiced our coral spotting skills with the help of a rising sun. 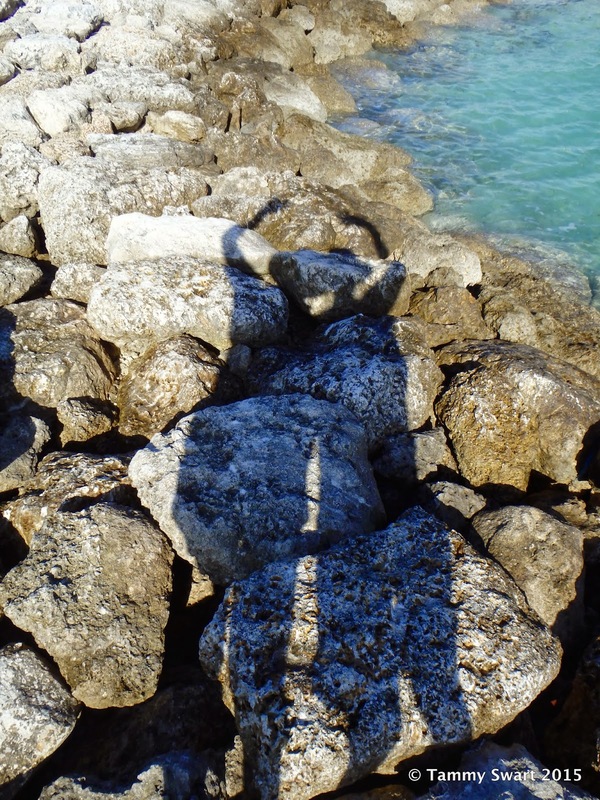 Bruce would call out when he spotted one of the dark blotches that signifies a coral head. Bruce was able to leave the bow and tend to sail trim while I stood on the aft deck and steered with the autopilot's remote control. There were a number of sailboats preparing to leave our marina when we left earlier in the day. As some of them began to approach us from behind, our need for speed increased. As you well know.. anytime there are two (or more) sailboats going in the same direction... it's a RACE! Perhaps the others didn't know it but we were competing! Bruce did all he could to get every bit of speed out of the 8-12 knot winds. We averaged about 5 knots of speed and the other boats soon overtook us. The winds got lighter and we discovered that our competitors were motorsailing... Eventually we dropped sails and motored the last mile or two into the anchorage. I'm still not comfortable sailing into an unknown anchorage. There was a shallow spot near a jagged rock that we must navigate around before we arrived to the protected waters of Allen's Cay Anchorage. There were already quite a few boats anchored on the glowing sandbar between Cays. We wondered as we picked our way through them, why they were all clustered in this spot when there was a much better and deeper spot just ahead. We continued on to our chosen spot and dropped anchor. We got as close to the shore as we could and dropped the dinghy into the water so that we could check that our anchor was secure. Unfortunately, we found it lying on it's side, completely NOT secure. We would get to do this anchoring thing again! We moved a couple hundred feet away and found a sandy spot to drop our hook. A repeat of the dinghy/looky bucket routine told us that this time, we were set! Time for a sundowner! The next morning was one of those that I will remember in my mind's eye as an all-time-best. To the softest pinks and blues the mind can imagine. It was one of those moments when you can't help but count your blessings and wonder how it is that all of this could be ours. Our little family relaxed in the cockpit, the cats completely comfortable after a cozy night in our family bed. We contemplated our choices for entertainment and were reluctant to get moving... but the day was marching on. We were soon visited by other Cruisers we had met at Palm Cay. They were out exploring and wanted us to come along. We had to decline, a sail repair project must take precedence with us today. But we would join them on the beach later for a bonfire. Well... this project isn't going to finish itself! Might as well get going. The winds could come up at any moment which would make dropping the headsail more difficult. We rolled out the jib and dropped it to the deck so that we could survey the damage. The rip is right along the edge where the sacrificial suncover is sewn on. This is a spot that was left exposed for over a year by not being tightly rolled while the boat sat for sale. It proves that sun can damage your sails so if you don't want to fix or replace them... better keep them covered! 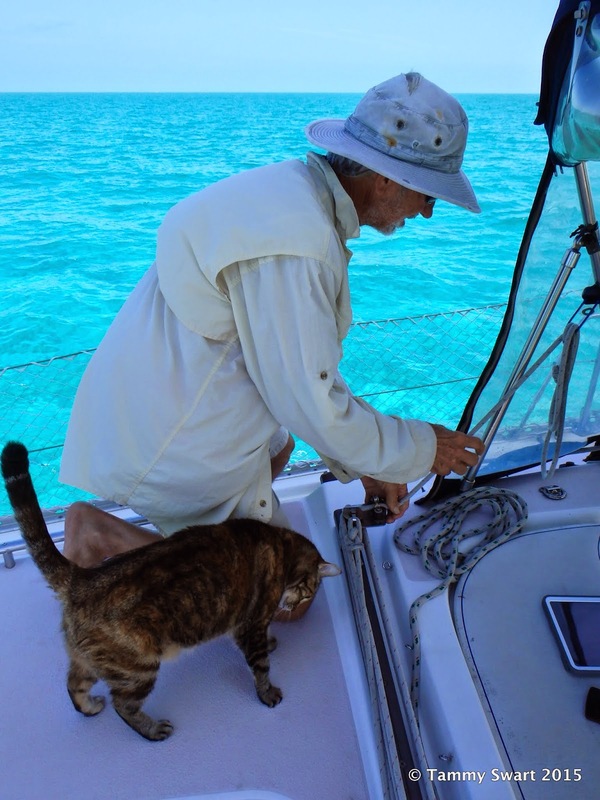 We assembled the tools we would need, lugging the heavy sail rite machine out onto the foredeck and went to work. Luckily we have been carrying around a small stormsail (we have two) that we could cannibalize for sail material. We spread it out down in the saloon and I used our hot knife to cut it in strips. The hot knife is another of those purchases that we doubted at the time... would we really ever use it? We have been thankful that we splurged and bought it because it has come in handy SO many times. The hot knife simultaneously cuts and seals the edges by melting them, and thus reduces the likelihood that our patch will unravel, without having to hem the edges. It's been a while since I used my Sailrite machine. I took the instruction book out on deck and made sure that it was all threaded correctly. I changed to a new needle. We chose black thread from our supply in hopes that it would be the better one for UV resistance. There was no internet of any kind here. 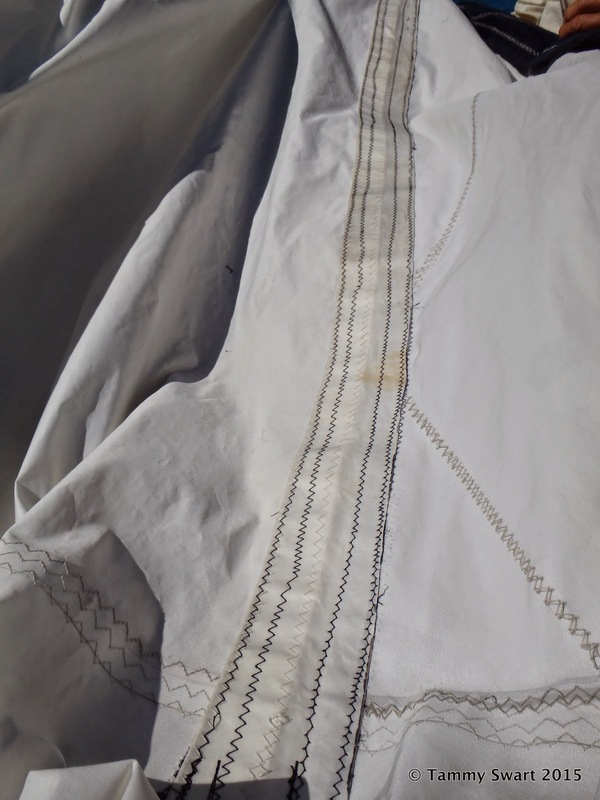 It would have been nice to be able to consult the Sailrite website, or my WWS sisters for advice regarding thread/needle choices, but this is what we've got... so it will have to do! My hopes of this being a quick project were dashed as time after time, I went back to the drawing board adjusting my thread tension. I just could not get it right. The machine would sew fine on my test sample, and then for a bit while I sewed the patch, then it would skip stitches and make longer ones, shorter ones... just a mess. And the fact that my thread was black on white material didn't make it any nicer looking. Eventually I was able to get both sides patched and stitched well enough that I thought they would hold for a while. I can always rip them all out and redo it with the help of some more knowledgeable cruiser somewhere along the line. It looks less awful from afar. We suited up and headed for the beach. That would be... the IGUANA beach! The beach was empty until we got close. Then they began to swagger to the waterline... beady eyes upon us as we approached. We didn't bring food. That's what they were looking for, of course. Would they be angered and attack us looking for a handout? Surely if that were the case, this beach would not be listed as an attraction for Cruisers... right? I gook scads of pictures...trying to get their "good side". Is there one? Some of the larger creatures were really quite amazing looking when you got close. One had pink scales and another had more greenish ones. There is a definite pecking order among iguanas. We witnessed a few minor skirmishes between them but none ever threatened us. Now and then one would tromp purposefully towards me but he would stop when I held my ground and didn't back away. We eventually got brave enough to turn our backs to them... Soon they lost interest in our lack of snacks. The lizards went back to the shade of the brush and we enjoyed the cool shallow water. It was delightfully refreshing after the long hours on deck in the sun. And there were some cute little silver guys hanging out with us. We cut our exploration of the anchorage short and dashed back across the shallows towards the boat. The water is indescribable in color as we avert a shallow sand ridge and enter the more deep waters near our boat. The current runs through Allen's Cay Anchorage pretty swiftly in the shallows between the cays. The waters are more swirling in the deeper spot where we are anchored. We don't have the definite in and out here, giving the wind a bigger influence on which way we lie. It also makes it very important to be far enough from your neighbor because the swirling causes boats to act unpredictably. We got cleaned up and went back to the beach to meet up with several other Cruiser boats for our first ever Cruiser Bonfire. The sun was just beginning it's descent making shadows long. We met on the smaller crescent of sand to the north of the iguana beach in hopes that there would be fewer (or none) of the beasts. Wrong. They were here as well although in fewer numbers and not as aggressive. I had brought a few lettuce scraps for them but one of the long time live aboard residents of the anchorage asked me not to feed them. Anyway, the iguanas soon left us when the fire got going. One of the other boats had thought ahead and collected some wood from New Providence, so we didn't have to collect wood. They did throw a few dried palm fronds on top to get things going and very soon we had our bonfire! We're making new friends and saying farewell, not knowing when we will see them again. Life is good. We needed water. We needed provisions. And we needed peace. All of these things and more, we would find at Palm Cay Marina. It is a relatively new facility and some parts are still under construction. There are four docks and we were placed on the furthest one in where there is only water available, no electricity yet. But we had our solar panels and generator so that was fine with us. The docks are wooden and fixed, and the finger piers only go out halfway, making getting on and off the boat a bit of a challenge at low tide. There is "city" water available on the dock which was a bit of a disappointment as we were hoping for some RO water. That's water derived from sea water via Reversed Osmosis. It's cleaner and safer than the mysterious origins of the City Water... We were somewhat indecisive about putting it into our tanks... but in the end, we did fill them up but kept jerry jugs of drinking water we still have leftover from our last fill in Florida. We'll get RO water somewhere down the line. Machines just like mine at home! This marina is part of a large gated condo/high end home community. The marina is still in the process of being built and for this reason, the laundry and shower facilities are currently housed in one of the condo units adjacent to the marina. 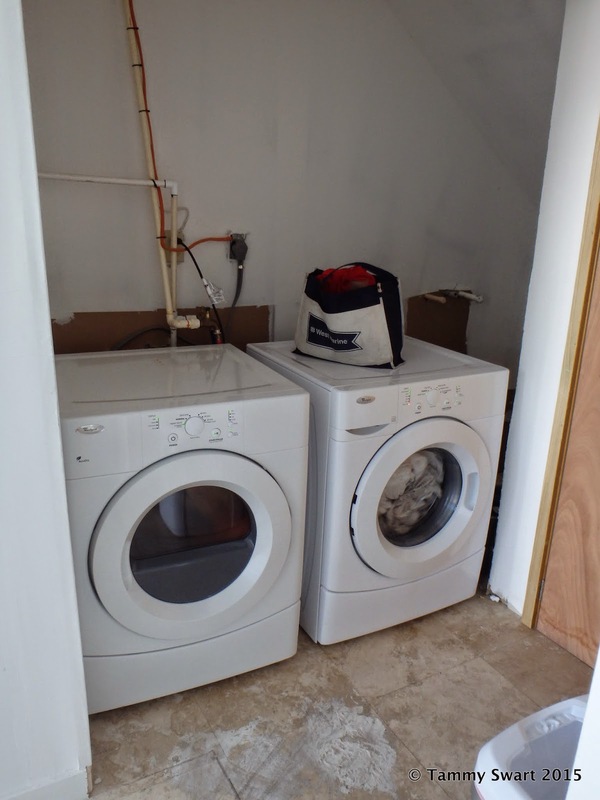 There is a toilet, a shower and one washer/dryer… but they are nice, and best of all… FREE! Free laundry! So what if we have to wait sometimes. I’ve got a mountain of laundry to do… can’t remember how long it’s been. Who knows how long it will be until we get to do laundry again!!! So much of our time here was spent in the laundry room. Nice pool... if only it were warm enough! Best way of doing laundry EVER! If only we had some donuts! The marina offers a courtesy car in two hour increments. We signed up for the afternoon of our second day but there was a bit of a mixup where one boater didn’t bring the car back and thus booted another boater out of their time. We volunteered to take her along with us to pick up her friend from the airport on our way to the grocery store. Marie was worried that her friend wouldn’t get the message to take a taxi, (which she actually did)… so poor Marie was stuck with us on our adventure, while her friend waited for her back at the marina. Driving is done on the left-hand side of the road… and there are multiple turnabouts instead of traffic lights… making driving on the streets of Nassau quite a challenge. Poor Bruce was strung out by the time we reached the airport… found out Marie’s friend HAD taken a taxi… and then backtracked to the grocery store. In my opinion he was just getting the hang of it… but he was sure to add a few beers to our grocery list to calm his nerves when we (finally) arrived back at the boat. We stayed an extra day (total of three nights) so that we could take advantage of the flat fee city water at the dock. Our boat was a mess after all the rocking and rolling and just simply getting here. The water went to good use in cleaning the boat inside and out. Bruce trying to show me the "single move checkmate"
We finished off all of our chores and enjoyed the nice beach and grounds and just generally recuperated from our ordeal in West Bay. I don’t think this marina gets as many visitors as some of the others, but I can highly recommend it, even though it isn’t quite finished yet. The basin is well protected and gated for safety. After all we have heard about the dangers of Nassau, we were happy with the extra security offered here. We will definitely come back! You might question whether or not this constitutes "R&R". The north winds howled and we slept in quiet stillness. We got our chores done and our house back in order. 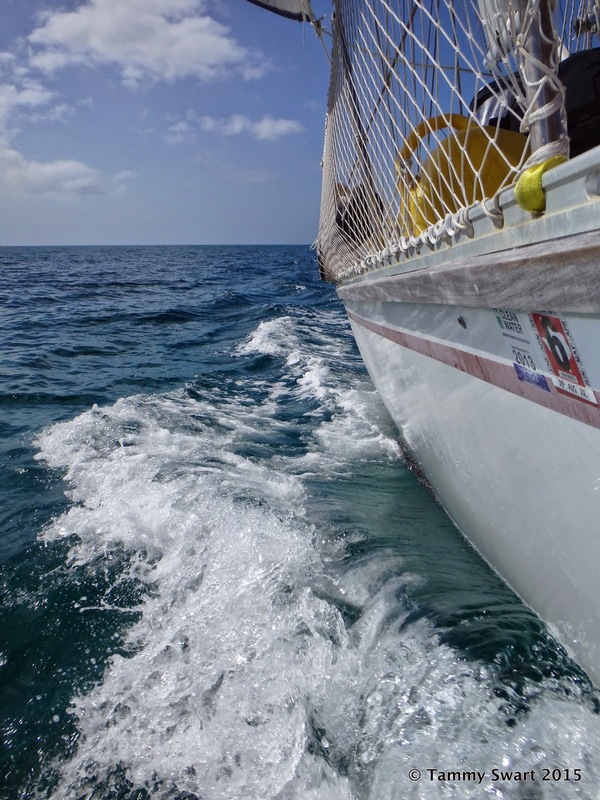 We topped off provisions and tanks and we had security and comfort with no chance of grounding or dragging anchor... that's what true rest and relaxation look like to us!